A long time ago there was a festival on October 31 to celebrate the harvest season. People tried to scare away evil spirits by dressing in scary costumes. The children would dress up and go door to door telling people that if they gave them a treat the evil spirits would go away. Years later the church decided to change the festival by making it a celebration of eternal life. Instead of honoring evil spirits they honored all the Christians who had died in the last year. This celebration was held on November 1 – called All Saints Day or All Hallowed Day (holy ones). The evening before was called “All Hallows Eve”. 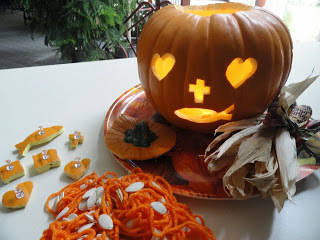 When planning for a pumpkin prayer family devotion time a real pumpkin can be used, or you can use an artificial hollow foam pumpkin (purchased from a craft store). Each step below includes actions to take in the process of carving your pumpkin, comments to make about what and why you are doing this step, a scripture reference and a short prayer. If you are using an artificial foam pumpkin, have the parts already cut out before starting the devotion. Clear push pins can be used on the cut out pieces as little handles aiding you in taking the pieces in and out. If you are using a fresh pumpkin, cover your work surface with newspaper first for easy cleanup. Cut each piece as you go along and have a family discussion about each part. God helps us to learn about Him. We need to be open to what God wants to do in our lives. * Prayer: Dear God, open my mind so I can learn about you. God takes away our sins and forgives us. We need to ask God to take away our sins every day. * Prayer: Take away all my sin and forgive me for the wrong things I do. at our families and see everything God has created! died on the cross for us and we know that God gave us all we really need. * Prayer: I’m sorry for turning up my nose to all You’ve given me. * Prayer: Open my ears so Your work I will hear. in the dirt when they met. We can use our mouths to tell others about Jesus. * Prayer: Open my mouth so I can tell others You’re near. 7. Light a candle inside the pumpkin. on an electric candle. Battery operated candles, votive or tea lights are a safe, great ideas. Dear Heavenly Father, open our minds so that we can learn more about you; Please take away our sin and forgive us of the wrong things we have done. Open our eyes so we can see how much you love us. You have given us so much. Please forgive us for turning up our noses at our many blessings. Open our ears so we can hear and understand your word and help us to know how to share the Good News with others. We ask that you help us let your light shine in all that we say and do. “God comes to us and picks us up from a lonely, cold field. He washes off all the dirt of our sin. He removes the seeds of doubt, fear, and hate that have grown inside of us. Then he places within us the light of his love. This love warms our hearts. What was once filled with darkness is now flooded with light. That love puts a smile on our face! to seek the Lord in all we do and say! Let our light shine for Jesus!